Getting student loans can seem like a great idea when you’re in college and have few other options. On the other hand, they can also seem like a bad idea when it’s time to pay the loans back. Chances are you’ll be looking for a job and trying to pay your other living expenses at the same time. This is why my most important rule for college students is to never take out more loans than you need. And my most important rule for college grads is don’t count on student loan forgiveness. Just as it sounds, student loan forgiveness is a federal program that will forgive your student loan debt after a certain amount of time. To many people who don’t understand this program, they may just think it sounds like a free pass. But it’s not. In order to take advantage of student loan forgiveness, you have to meet certain requirements. One requirement is making at least 120 on-time payments on your student loans. You also have to work in a specific field, like public service or for a non-profit. 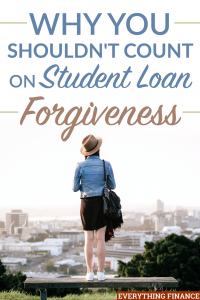 That being said, it’s usually not a good idea to count on student loan forgiveness when you are struggling to pay off your loans, and you don’t have enough money to pay for bills and near bankruptcy, is better to get informed about what you can and should do with people who really knows about it as Conner & Roberts or other law firms. The student loan forgiveness program is a federal program. Therefore, it only works with federal student loans. If you have private student loans, there’s no chance they’ll get forgiven. So, don’t waste your time waiting for this program to kick in. With the Public Service Loan Forgiveness (PSLF) program, student loan forgiveness won’t be granted unless you’ve made at least 120 on-time qualifying payments. In other words, that’s 10 year’s worth of payments. If you take out a massive amount of student loans, you’ll still have to make payments each month for 10 years before you can even think about having the remaining balance forgiven. 10 years is a long time and anything can happen. But with other federal student loan forgiveness programs, you have to wait 20-25 years before you can qualify to have your student loans forgiven. If you can’t imagine struggling to make student loan payments for 10-25 years, you probably don’t want to count on student loan forgiveness. Plus, you may even be able to pay your loans off during that time anyway. In order to qualify for student loan forgiveness, you also have to work in a certain job field. This is usually in the non-profit or government sector. If you are a teacher or nurse who works for the state, you’ll probably qualify for student loan forgiveness but if you’re a graphic designer or a nutritionist you probably won’t. Not to mention, you must work in a qualifying job for at least 10 years depending on which forgiveness program you’re hoping to qualify for. Again, this is a long time to sit and wait for student loan forgiveness. You may want to make a career change or switch jobs which could make you ineligible. Let’s say you wait it out for several years and qualify for student loan forgiveness. You’ll still have to pay taxes on the remaining balance that’s forgiven since the government will count it as taxable income. Depending on what your remaining balance is, you could be on the hook for paying the IRS thousands of dollars as soon as you file your taxes. In short, student loan forgiveness is not a fast-track solution if you can’t or don’t want to pay back your student loans. So, you shouldn’t count on it. Contrary to popular belief, most people won’t qualify and the few that wait it out and qualify will still have to pay taxes on the amount of their balance that gets forgiven. If you are struggling to pay off your student loan debt and looking for a solution, I’d highly recommend you consider one of these options below. If you have private student loans at a high interest rate or just a large amount of debt, you should consider refinancing your student loans. Refinancing your debt involves getting a new loan with a new lender. The main idea is to obtain a lower interest rate and/or lower your minimum monthly payment so you can put less money toward interest and pay off your debt faster. If you have federal student loans and you’re looking to refinance, you should take some time to think about it because if you refinance federal student loans, you won’t be eligible for federal student loan debt relief options like deferment or forbearance if you need them in the future. With federal student loans, you have the option of switching to an income-based repayment plan if you are struggling to make payments. With an income-based repayment plan, you can make payments based on how much you earn. If you are unable to make payments, you can also consider applying for deferment or forbearance. This will pause your requirement to make monthly payments. But, interest will still accrue. Finally, the third option is to work on lowering your expenses and powering through debt payoff. Waiting for student loan forgiveness or taking advantage of programs like deferment can be helpful if you truly need them. But they can often slow down your progress when you could just pay your loans off. If you know you’re not going to qualify for student loan forgiveness, you need to create a plan to pay off your student loans. If your student loan payment is taking up a lot of space in your monthly budget, see if you can cut other expenses. You can do things like move in with relatives to save money on rent, stop dining out and start packing lunches for work, give up your gym membership and workout at home, cut cable, or find a cheaper cell phone provider. Cutting your expenses can free up a nice chunk of money that you can put toward your student loans. You can also work a side job or ask for a raise to bring more money in to pay off your student loans. If you can afford to, make extra payments. The sooner you pay your debt off, the more money you’ll have for the future. As you find ways to save and earn more, you may find out what you don’t need the full 10 year-period to pay off your student loans. How are you handling your student loan debt? Have you ever considered student loan forgiveness as an option for you?